Boat wood furniture made in Indonesia. The wood taken from reclaimed wooden fishing boats which available widely across Indonesia. The color on the wood is its original colors, we don't add new colors on the boat wood surface. 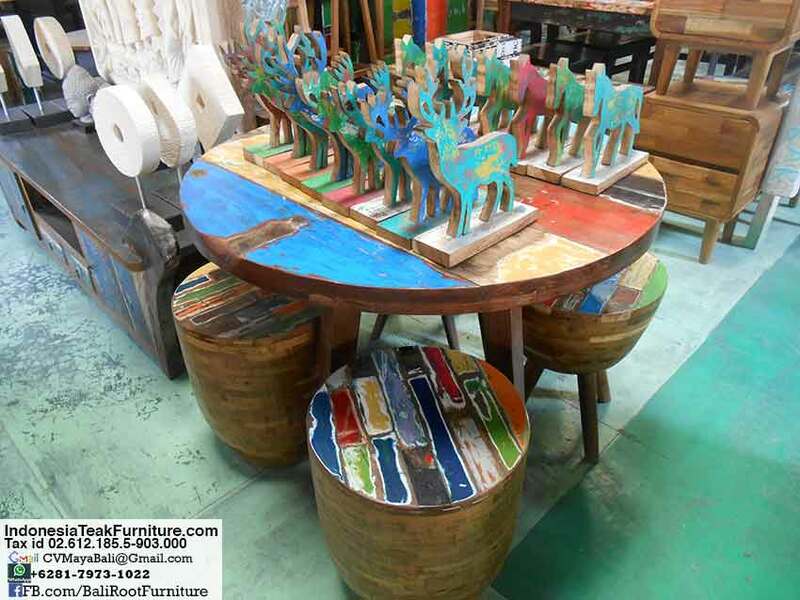 Each piece is unique, when you order our boat wood furniture, you might receive different in color from photo shown here. Wooden furniture made in Indonesia. You can find wide range of furniture here including chairs, table, bench or cabinets. All made of solid wood. To order our furniture, please email us with your order in details included in your email the item number and quantity needed. Also please remember to provide us with brief information regarding your company or business. We need to know the shipping port in your country in order to calculate shipping charges for your order. If possible, please provide details about your freight agent so we could ask our freight agent to contact yours. Bali furniture for export. Buy direct from factory and exporter in Bali Indonesia. Browse our wide range of furniture made in Indonesia. We have many furniture available for you to import to your country. All handmade in Indonesia.